These juicy, meaty lamb chops sizzled in extra-olive oil with plenty of garlic cloves enhance and define both sweetness and savour. 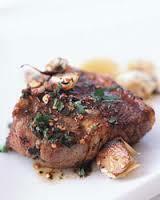 1) Season the lamb with salt and pepper and sprinkle lightly with thyme. In a very large skillet, heat the olive oil until shimmering. 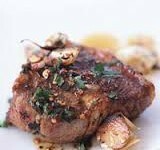 Add the lamb chops and garlic and cook over moderately high heat until the chops are browned on the bottom, about 3 minutes. Turn the chops and garlic and cook until the chops are browned, about 2 minutes longer for medium meat. Transfer the chops to plates, leaving the garlic in skillet. 2) Add the water, lemon juice, parsley and crushed red pepper to the pan and cook, scraping up any browned bits stuck to the bottom, until sizzling, about 1 minute. Pour the garlic and pan sauce over the lab chops and serve immediately.